The units listed below are available for short, medium and long-term hire at highly competitive rates. As the hire period increases, our discount structure reduces the daily hire rates significantly. Machine familiarisation training is conducted for the operator(s) upon handover at no charge to the client. We are able to deliver the machines to site at below-market rates using our own delivery vehicles. These units have rotating articulated knuckle booms (up, out and over reach) or telescopic booms (maximum horizontal outreach) and are driveable at full extension. 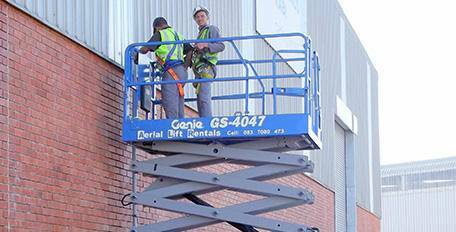 Boom jibs and rotating, self-levelling platforms assist with accurate positioning of the work platform. They are powered by quiet, low-emission diesel engines and their four-wheel drive and oscillating axles make them ideal for rough-terrain outdoor worksites. Stability is achieved by means of counterweights and tilt sensors.